When my 924 S first arrived I was pleased to discover that it didn’t have power assisted steering. As the Porsche was bought as a track project I wanted a manual rack, for the feel and the feedback. The strange thing was, driving the car, it wasn’t quite what I’d wanted. It had the feedback however, at high speeds it felt too light. The other slight problem came at low speed, sharp corners, it was taking more turning of the wheel than I’d hoped to take to job done; something that is exacerbated by the close proximity of the steering wheel to my legs. But it was what it was. Some time later I bought my second 924 S and this one came with PAS. Driving that car I soon noticed that rather than being the lesser option the assistance actually felt far better; there was even more feel and feedback and it was quite a bit quicker. I dug out my little book of 924 S stats and discovered the ratio on the manual rack was 22.39: against the PAS rack’s 18.96:1. The ratio represents the number of degrees the car wheels turn with a 360° turn of the wheel; so, manual, 16° per turn, and PAS, 19°. In actual degrees that may not sound much, but that’s not far off a 20% increase and translates to a quicker rack. So, I set about a conversion. Rather than just slot in a power rack, with the associated pump and other bits, I wanted a power rack to run without the assistance, you know, for the feedback and whatnot. This would keep the cost and weight down and also reduce the resistance on the engine, not that I suspect that it makes that much difference to performance. First job was to buy myself a power rack. I found a 944 PAS rack on eBay for a mere £60. Sadly that wasn’t the end of the costs. Checking what needed doing I found there was an issue with the track rods; the 944 rods are different from the 924 rods (I assume because of the wider track) so they needed swapping for 924 items. Easy? No. Porsche made the track rods for the PAS rack different from the manual rack meaning I couldn’t just swap them from the original rack. I ordered up some aftermarket items. The next issue; lubrication. 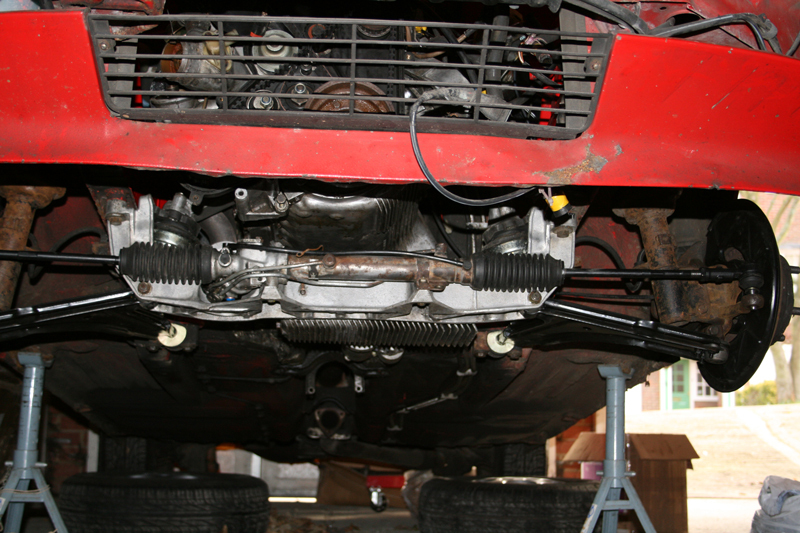 A manual rack is a sealed unit with greased gears whereas the PAS rack uses the steering fluid (or ATF in the case of the 924). I could have opened the rack up, greased the gears and used bolts to plug the holes, but I didn’t really like the idea of opening it up, and I wasn’t sure what the tolerances were and whether they would work with the grease. I could have done something similar using AFT but was worried that this might create a pressure lock. Instead I needed to rig up the rack with hoses connected as they would be on a power rack and run up to a fluid reservoir. I took the steering rack over to Race Parts in Wallingford, dumped it on the counter and explained to Nick what I had in mind. I went in there looking for banjo bolts, but for a system that wasn’t under pressure we decided that it was probably overengineering. Instead I opted for 90° push connectors. It took a while but we (Nick) managed to find a bolt to fit – they’re AP Engineering! I took the connectors into Marparts in Caversham, they sorted me out with some hoses and clips. I ordered a ZF steering reservoir from eBay – the Porsche ones were expensive compared to others so I bought a Land Rover one for about £10. I think they are actually the same, one just comes without the Porsche tax. Assembly was actually remarkably easy. Bolt the steering rack to the freshly cleaned crossmember and bolt in the push connectors. Fix the fluid reservoir in place and then run the hoses from one to the other. Originally I had fitted connectors to the bottom of the reservoir, to adapt it to the size of the hoses, but this kept on leaking – which has damaged one of the anti roll bar bushes. Ultimately I have used a bigger hose on the standard reservoir connectors and pushed the smaller hoses from the steering rack inside and secure them with clips, I used a hose repair kit to wrap around the join to ensure there were no leaks. To fill the system with fluid I removed one of the hoses from the reservoir, blocked the hole on the bottom of the reservoir and filled it until the fluid came back round and out of the freed hose, then connected everything back up. The end result? Quicker steering from power rack, but without the hydraulic assistance, it feels firmer than the PAS setup in the other car and the feedback is excellent. Needless to say, the quicker ratio means the car is a sonofabitch at parking speeds, but once I get above about 10mph it lightens right up. The handling feels a lot better at speed, much heavier. It was a very worthwhile upgrade, although if you I had power rack already I certainly wouldn’t bother messing around with it, for weight and feel it really doesn’t lose much over this setup and it makes the car easier at low speeds. 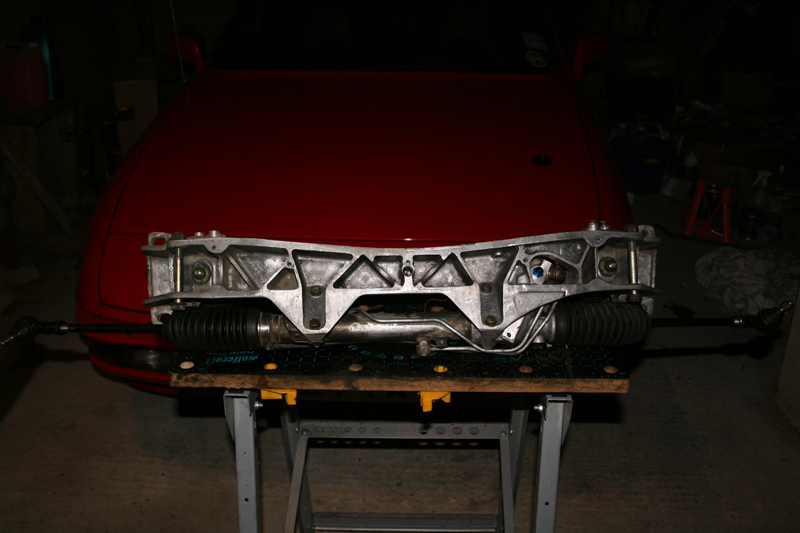 Just fit a 944 power rack – you should be able to buy the rack and pump together, you then just need the sundries. If you already have PAS then it’s broken, it was fitted to my other 924 S and if working properly your wife wouldn’t have any problems driving the car. I had a car with electric power steering and it was horrible in comparison. Also, the conversion would be an expensive pain in the arse. And it would ruin the car.